This Labor Day weekend was the first in a while that I didn't have to work, so we took advantage with a day of wandering, a day of work, and a baseball day. We started off with a trip to Fredericksburg (about 1.5-2 HR drive) in the Hill Country portion of central Texas. It was a sunny day, so it made for a lovely drive. With all the rain we've had this spring and summer, it was quite green and beautiful. On the way from Austin to Fredericksburg, is the Texas Wine Road, which we decided to take part in. 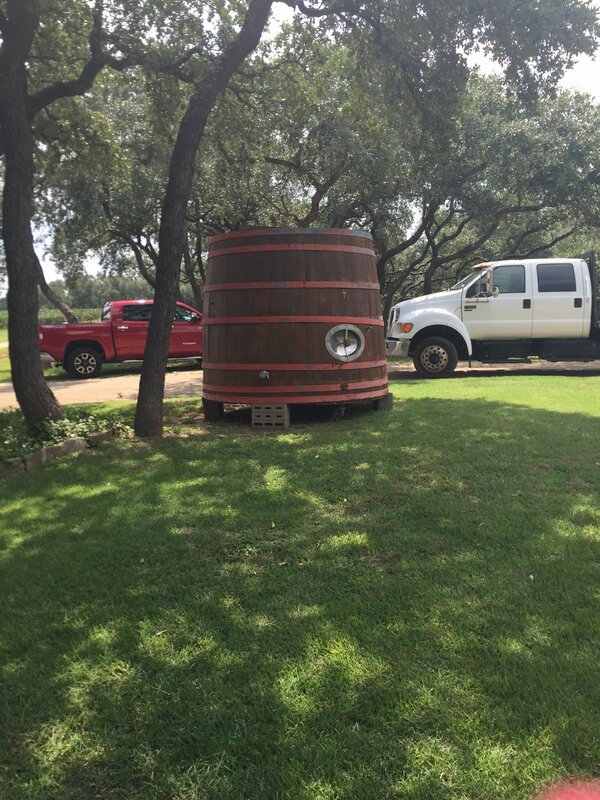 We stopped at the Texas Hille Vineyard, which was a little off the beaten path. The drive to the vineyard definitely reminded me of Missouri Wine Country, complete with a few twisty spots. The winery was beautiful and we showed up at the perfect time. There was a bus full of people on a tour, so we quickly partook in a wine tasting. We tried 5 different wines and ended up buying two and getting our tastings for free. As we were paying, the tour finished and it was time for us to move along. We grabbed a few more pictures and headed on to our final destination. My idea to visit Fredericksburg, a small German founded town, must not have been unique because the town was packed! We picked a place to eat on our way, but there was no parking to be found! We ended up going out of the way just to find a good spot. On our way to Silver Creek Beer Garden and Grille, we passed by several stores, noting which we'd stop by on our way back. After our walk, we definitely had an appetite and thirst for some great German food. We started off with a delicious brew while we browsed the menu. I opted for the pepper wurst sandwich with fries and Mike selected the schnitzel sandwich with fries. The food was delightful and we made great choices. The sausage was a little spicy and cooked to perfection. The schnitzel was something new for us and paired great with the mustard. After lunch, we stopped by a few stores and picked up some fudge and popcorn. It was pretty crowded so we skipped most of the stores. Our drive home was long, but uneventful. We had a great day and look forward to future weekend adventures.